India recently concluded S-400 deal with Russia for the acquisition of five regiments of Russian Triumph air defence system. The S-400 Triumph is state-of-the-art latest Russian air defence system which is capable of shooting down any airborne threat . The S-400 system is reported to be equally effective against all kinds of conventional targets. The system can also engage even fifth-generation stealth fighter planes and hypersonic ballistic missiles which makes this system most feared and a complete game changer. The S 400 is once again catching up the news headlines. The Russian S-400 has recently bagged many orders for this formidable air defence system , including from the countries which are considered to be a part of US inner circle. India has recently concluded the deal with Russia for the purchase of the S-400 system and would be delivered to India by 2020. India has signed the agreement for S 400 Triumph with Russia during the recent visit of Vladimir Putin’s to India. India has gone ahead with this deal despite the US repeated warnings for invoking sanctions under CAATSA . Even Turkey has also gone ahead with the S 400 deal with Russia despite US putting on hold the delivery of F 35 stealth fighters scheduled to be delivered to Turkey. In this article , IDN would bring you all the relevant details about the S-400 air defence System and what makes this system one of the most feared and formidable air defence system. India has recently signed the agreement with Russia for $ 5.4 Billion ( Rs.40,000 Crores ) for the supply of five regiments of the s400 system and its associated equipment. This is going to be the biggest deal so far, although Russia has been a major supplier of defence equipment to India and bulk of the weapon systems in Indian armed forces are of Russian origin. India already enjoys a significant edge over Pakistan in terms of comparative military strength. As per the world military ranking , Pakistan ranks on thirteen position. Whereas India ranks on the fourth position just behind China which is on the third position. However, Pakistan’s nuclear arsenal and ballistic missiles continue to be a major threat for India . With Indian S-400 deployment along Pakistan border , entire Pakistan will be covered within the striking range of Indian S-400 system . India has also deployed military satellites which are scanning the Pakistani air space. The S-400 system will give India a clear edge over Pakistan in the event of any conflict. China, on the other hand, can no longer enjoy an edge over Indian air force by deploying stealth fighters. The Chinese version of S-400 purchased from Russia are not equipped with 400 KM plus range missiles . 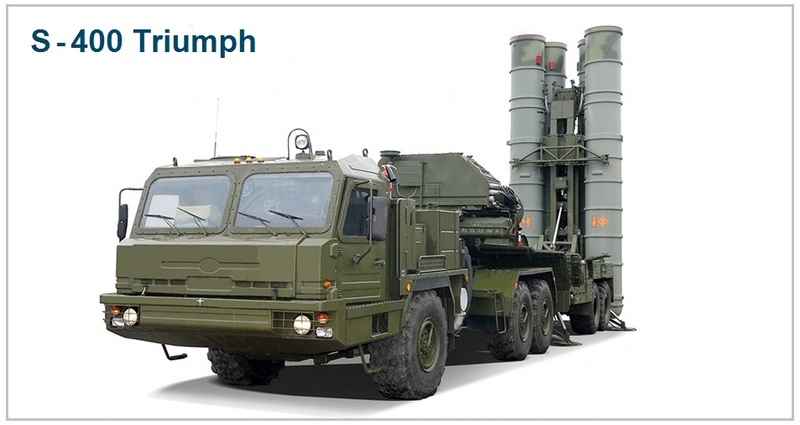 Whereas the Indian S-400 will be equipped with long-range 400 plus km SAM 40N6E missiles . The S-400 system is equally effective against stealth fighter and will help India to neutralize such threat . The S-400 system and French Rafale fighter will give Indian Air Force a clear edge over its adversaries. The S-400 Triumph is the latest Russian Surface to air ( SAM ) air defence system that has been designed to shoot down any airborne threat which includes planes , ballistic missiles , cruise missiles , drones and any such airborne target . The S-400 SAM system derives its legacy from its predecessors which includes S-200 and S-300 air defence systems of Russian origin . 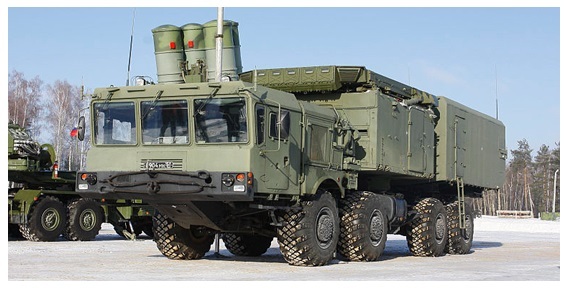 This system has been designed by Almaz Central Design Bureau which is an upgraded version of the S-300 system . The S-400 development started way back in 1993 and the system was first inducted into the Russian air force in 1999 . The triumph missile system has fully automated operations . The S-400 can easily detect both short and long range targets . The S-400 is a highly mobile system that can be deployed in a very short span of time . Its radar can scan the air space for a distance right up to 600 KM, track the target once it is detected and lock on to the target to be destroyed . The system can fire surface-to-air missile once the target is locked on within its kill zone . The triumph system can simultaneously engage 40 targets and the SAM missiles can be fired vertically with 360-degree coverage . The system can fire a missile to the target without any necessity to be fired in the direction of the target . This is a is a huge advantage which reduces the system reaction time . The S-400 system makes use of four different types of missiles and fires the appropriate SAM depending upon the type of the target , engagement distance and the altitude . The S-400 system has been designed to shoot down different types of targets such as highly manoeuvrable fighter planes , supersonic ballistic missiles , AWACS systems . The system is equally effective against small size drones and UAV . Depending upon the threat type , the S-400 system makes use of four different types of surface-to-air missiles ( SAM ) to engage and destroy the target. The S-400 SAM missiles include a combination of both short-range quick reaction missile as well as very long range missiles depending upon the target to be engaged .These missiles include very-long-range 40N6 missile ( 400 km ), the long-range 48N6 missile ( 250 km ), the medium-range 9M96E2 missile ( 120 km ) and the short-range quick reaction 9M96E missile ( 40 km ). The heart of the S-400 Triumph system is the command post where various system components are integrated and managed .The S-400 command post station 55K6E is mounted on the Ural-532301 mobile command post vehicle. The command post is equipped with LCD consoles to process the airspace surveillance data of the individual batteries. It controls and monitors long-range surveillance radar, tracks airborne threats, prioritises the threats, and coordinates other batteries. One Air Defence Unit Commander. One Air Situation Management Officer. The S-400 system can be integrated with the compatible battlefield management system and capable of exchanging data with other defence systems. The Russian S-400 system makes use of different types of radars for target acquisition and tracking. This radar is Russian equivalent for American MPQ-53 Patriot system engagement radar .The 92N6E Grave Stone radar can automatically prioritise various targets being tracked by the system . The onboard computers computes the Launch Acceptable Regions for missile launches , launch missiles, track missiles, and the provide the midcourse guidance commands to missiles while tracking the target and missile. The Grave Stone radar can simultaneously track over 100 targets in Track While Scan mode, and perform the precision tracking of six targets concurrently for missile engagements. The data exchanges between the 92N6E Grave Stone Radar and the 30K6E Battle Management System are fully automatic. The 91N6E Big Bird Acquisition radar can detect and track all types fixed wing aircraft, rotary wing aircraft such as helicopters , ballistic and cruise missiles, UAV and drones within the distance of 600 km. The radar can simultaneously track up to 300 targets. The S-400 91N6E Big Bird acquisition and battle management radar is mounted on the 8 by 8 trailer. The 91N6E radar has been designed for acquiring and tracking all types of aerial and ballistic targets, identifying targets, and performing the calculations to precisely neutralize the target with a suitable missile. China became the first customer for Russian S 400 air defence system and placed the order in 2014 . China has also received the delivery of the system and as per the recent media reports , China has recently conducted the successful test firing of the system . However, the system supplied to China may not include very long range 40N6 missile which has an effective engagement range of 400 km since China is not a signatory to MTCR . The Missile Technology Control Regime ( MTCR ) represents a group of countries with an informal and voluntary partnership among 35 countries with the objective to prevent the proliferation of missile and unmanned aerial vechicle technology that can carry a payload of 500 kg for a range beyond 300 km. As per MTCR regulation, the export of missiles and related technology beyond 300 km is prohibited to countries other than member countries . The S 400 system acquired by China is still going to be a big challenge to the US in the event of any conflict over south china sea dispute. India finally decided to go ahead with the S-400 deal with Russia despite repeated US warning to India for invoking CATSA for imposing sanctions. India and Russia had been negotiating this deal for a long time . India and Russia recently concluded this long-awaited deal for $ 5 Billion which includes five regiments of S 400 system, different types of missiles and associated equipment. The Indian order is significant because India despite being a major defence partner of the US still opted for S 400 system and did not succumb to the US pressure to select from the American systems . The US government do realize that any sanctions against India could be counterproductive considering number of defence deals in the pipeline with leading US companies. Further US sanctions against India may also jeopardise the quad lateral alliance ( US , India , Japan and Australia ) shaping up to neutralize the Chinese aggression. The S 400 deal with India is equally significant victory for Russia which has retained its position as a largest arms supplier to India . India is amongst the top three arms importer in the world and currently modernizing its armed forces by spending billions of dollars . This deal is expected to encounter some problems as US may create some hurdles for payments to Russia in dollar . And therefore , alternate methods are being worked out by both the governments to overcome US dollar payment hurdles . The US has refrained from initiating any punitive sanctions against India for obvious reasons . On the other hand , China has been penalized for going ahead with S 400 deal with Russia. The acquisition of S 400 System and also the purchase of Rafale fighter planes from France will allow India to build some credible deterrence against China. As described by “The Economist” , The S-400 system is one of the best air defence system in the world today . The S400 system offers a comprehensive solution to identify, track and engage all kinds of airborne threats including ballistic missiles and stealth aircraft. The S-400 system is a complete game changer and formidable force multiplier. The Indian acquisition of Russian S400 Triumph system and some other high profile force multiplier weapon system such as Rafale fighter planes from France would significantly boost India’s air combat capabilities . The S-400 air defence system is being inducted at a very crucial time especially when the Indian Air Force is facing a major challenge of depleting squadron numbers and struggling to maintain the current strength of number of operational squadron numbers . The ballistic missile defence shield being developed by India is still not operational and at the moment Indian defences are vulnerable against the ballistic missiles being deployed by both China and Pakistan . The S-400 system will significantly plug this gap and will offer a credible deterrence.